It seems to never fail, if you’re going to get the flu during the winter it happens over the holidays. Why is this such a common occurrence? It’s quite common for people to fall ill over a vacation. It’s so common in fact, psychologists sometimes refer to it as leisure sickness. 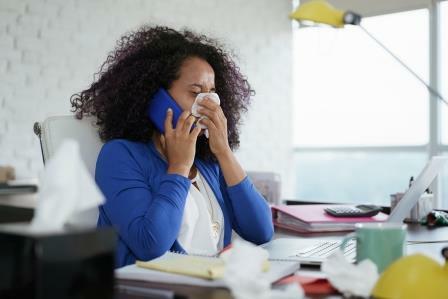 Maybe it’s the mad rush to get everything done before you leave the office for a few days that puts your immune system at risk. Or possibly you get the sniffles because you finally relax while on vacation and let your guard down allowing that cold to become a full-blown sickness. More likely the cause of sickness around the holidays is from being out and about in crowded stores and going to holiday get-togethers. In the run up to your vacation, just think about the number of hours you spend shopping, for instance. Now multiply that time and exposure by the number of people in your office. Yikes. That adds up to a lot of opportunity for exposure to sickness. Think now about your co-workers bringing that exposure into the office. It makes you want to reach for a Lysol wipe, doesn’t it? Luckily for you we have some great tips to staying healthy this season. Wash your hands. Your mother was right. Clean hands keep you healthy. Do not rub your eyes or touch your nose after you’ve been in a busy store. Again, see bullet number one on hand washing. Those droplets of sneeze-borne illness being blown about the store end up on the things you touch. Try to relax this season. The stress hormone cortisol gets worn down the more stressed you get. So, relax and allow your body to fight off any viruses on its own. Use disinfectant wipes like Lysol to wipe up areas around your work desk and the break room. Keep some Purell handy too to keep your hands clean when you don’t have access to soap and water. We wish you a very Merry Christmas and Happy New Year. Stay healthy. Keep the office clean!